In part one, Jim walked us through the early days at MRG, when we built a global network of practitioners and provided assessments for thousands of individuals around the world – all without the internet. In this post, he brings us to the present day. To catch up, click here to read part one. 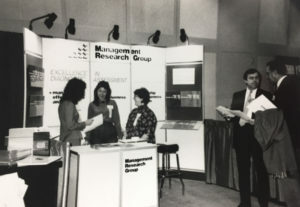 The advent of the internet meant that people could get to know MRG from anywhere in the world – even if they couldn’t make it to a trade show. By 1996 the internet was emerging. MRG acquired “MRG.com” as its domain name and developed its first website. By 2001, living in a more connected world had made a major impact on the way we did business: with the implementation of Q-Online to process all assessment questionnaires, participation in the assessment process was faster, easier and more accessible than ever. It was becoming obvious that MRG was very much a technology-based company; yet all of our technology needs were still being contracted from outside resources. In 2005, a decision was made to legitimize the technology function within the company by hiring a higher level professional, with support being provided by contract personnel with specific areas of expertise. This led to the development of newer software standards and ultimately the creation of a modern infrastructure. Another notable shift in technology occurred in 2011, with a change in the leadership of the function. As a result, two things happened. There was a focus on creating much greater flexibility in report generation, which meant that reports could be customized to meet the needs of clients and their specific interventions. Also, after listening to consultants, efforts were made to make the basic systems much more user-friendly (an effort that continues to this day). In the last decade, the addition of an education professional to the MRG team resulted in new ways to employ technology. A move to online certification was met with great enthusiasm – now 85% of our certifications are conducted online. This has exposed us to broader geographical markets, and allows us to have participants from very diverse cultures in the same session exchanging their various views. We are currently facilitating an LEA session with people from Spain, Italy, Belgium, the United Kingdom and five different US states. 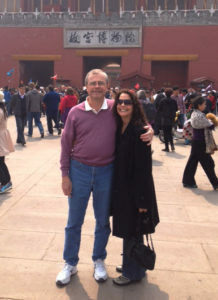 In his three decades at MRG, Jim’s work has brought him around the world many times over; here, a 2013 visit to China with MRG president Tricia Naddaff. More recently, the further expansion of the technology team, which has brought added expertise, has allowed for the ongoing efforts to modernize the entire look and feel of all of the assessments. It has also led to new products like Momentum. With Momentum, an LEA 360™ client, working on changing a behavior, can receive periodic feedback on his/her progress via a phone, computer or iPad. This instant and constant ability to receive feedback on an individual’s behavior change efforts creates a deeper understanding of the behavior and its potential impact on one’s efforts to be more effective in a leadership role. The more a person can see and feel the impact of their behavior on others, the greater the incentive to continue the behavior. The pace of this change causes me to feel like Dorothy in the Wizard of Oz when she says, “Toto, I’ve got a feeling that we’re not in Kansas anymore.” Hopefully, for most of you, this change is viewed as less disorienting – I hope it contributes to rewarding experiences in your work. For me personally, I am regularly amazed at the experiences that consultants are having with the data provided by the LEA. My greatest hope is that through technology, research, and ever-expanding consulting experiences, that MRG will continue to make a greater and greater impact on the world. A true original, Jim has been with MRG since its inception in 1983.